TMZ SPORTS -- Oscar De La Hoya has zero intentions to run for president and is only claiming he's serious about a campaign to try to drum up interest in his GGG-Canelo fight ... so says Jim Gray. We broke the story ... ODLH told us he's really exploring the idea of becoming president one day because he wants to have a bigger platform to use his voice. 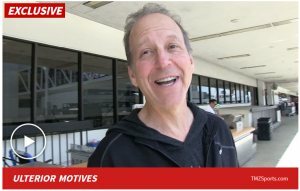 When we got Gray -- a Showtime boxing host -- out at LAX and asked about Oscar's potential candidacy ... Gray was hardly buying it. "Really? Come on," Gray tells us. "I think he's trying to promote his fight. I think his fight may not be doing as well as he's hoping. So, he's trying to bring attention. So, what better way to get attention than to say, 'I want to run for president?'" You be the judge ... does this sound like a man who's lying? !